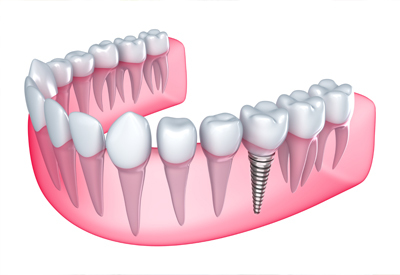 Replacing a single missing tooth can be most authentically accomplished with a single dental implant. The post of the implant mimics the root of your tooth while the dental crown looks and functions just like your natural tooth, requiring no additional maintenance. Compared to a traditional teeth implant procedure, mini dental implants can be placed in a matter of two hours or less. Although, there is a long process of planning the location of the implants before the procedure, the surgery itself is much quicker. Your dentures or implant crown can even be attached in the same appointment. This means that there is no need for multiple office visits. Due to the smaller teeth implant size, mini dental implants cause less disturbance to bone and tissue structures. Only a small opening in the gum line is needed for the implants to be threaded into the jaw bone. Not only does this make the procedure less invasive, it also makes it possible for patients with low bone density to receive mini dental implants. Conventional teeth implant technology requires cutting the gum tissue and drilling a large hole in the bone where the implant is placed. It generally takes about three to six months for the area to fully heal. Mini dental implants work differently. The smaller diameter means that minimal force is needed to place the implant, so therefore surrounding bone is better preserved. As a result, there is less time needed for healing and the implants can immediately receive biting force without causing significant pain or discomfort. Mini dental implants offer an alternative to traditional implants, which do require a certain amount of healing time. To learn more about the benefits of mini dental implants in Fair Oaks, CA, contact Dr. Smith and schedule your consultation today!